We want to start by discussing our backpack selections which seems, in turn, to demand an explanation of what we desired in our backpack and how needs were determined. Between us we probably own over a dozen backpacks (mostly meJ) but when undertaking this hike we had to take into consideration variations which we haven’t faced in the past. Previously all our hikes have included leaving from “home base” and returning to the same place; kinda makes it easy to leave the heavy stuff behind and just come back to it at the end of the hike…this time there is no plan to return to our starting point! This means EVERTHING we need for the trip has to come with us AND stay with us! We had 3 HUGE concerns; what did we NEED, what would it weigh and how much space would it take (volume of the backpack). These concerns were the driving force in every item we decided to carry and what we decided to carry it in. 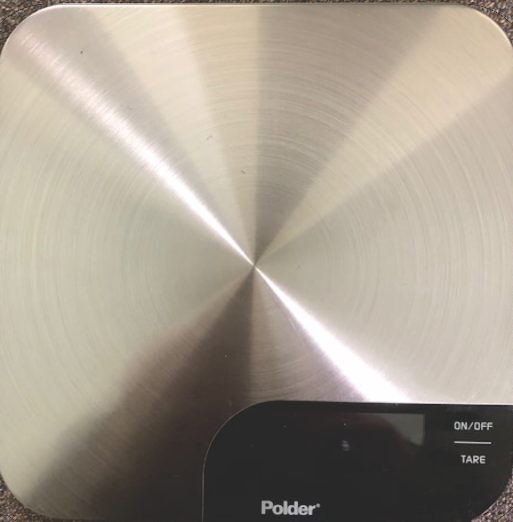 Almost a year ago we began assembling a list of items that were absolutely essential, how much space the essentials would require and determining how much would they weigh. We read endless articles on the trail, watched what seems like billions of hours of YouTube videos, read numerous books and attended lectures from those who have gone before us. We took a couple of things VERY seriously; foot care first and foremost. Almost everything we read and viewed had horror stories of people who, early on in the hike, suffered from horrible, almost debilitating blisters, we decided that we needed to avoid this at all costs. At the end we decided that it would be prudent to begin the process of assembling items and then, later in the process to select the backpack we would use. It seemed obvious that the proper backpack would be critical, but how to select a backpack before you knew for sure what the weight and volume of the “stuff” in it would be was a challenge, I am gonna show you the backpack but first, how did we determine the size? It started with dozens of trips to REI and hours on Amazon.com. Initially this was focused on FEET, what kind shoes? Socks? Sock liners? Material? Foot powder? Blister preventatives? Remedies? Were some of the things we researched. Once we settled on our initial (some things changed during the planning process) footwear and foot care items we felt comfortable moving on to other important items. Every item of clothing we intended to carry was evaluated in every way we knew how. From socks, to underwear, pants, layers for warmth, rain wear, hats, everything. We wanted to know things like “would the fabric wick moisture quickly?” Would the material chaff? How often would it need to be washed? How long would it take to dry? WHAT DID IT WEIGH? Weight, weight, weight. It seemed like every item we spoke about came back around to WEIGHT! As the selection progressed we decided that, since we might be hiking as much as 15 miles day we wanted to keep total weight on our back in the 8 to 12 pound range with 8-10 being optimal. This being the case every ounce was taken into consideration. As a man who loves the kitchen I am in possession of a Polder digital kitchen scale that measures to the 1/10th of an ounce and this tool was used to excess. I am probably the only person in my social circle that knows my ExOfficio underwear weighs 2.4 oz and that a weeks worth of disposable ear plugs weighs 0.3 oz! I know that a converter from European power to U.S. weighs 0.7 oz and that a small shaker of “Gold Bond” foot powder weighs 1.5 oz and if I take the powder out of the shaker and put it in a baggie it only weighs 1.1 oz; yep watching, literally, every ounce. As the process progressed we began to accumulate clothing, accessories and toiletries which gave us a good idea of what size backpack we would need to comfortably hold it all. Brenda will explain her backpack choice and how it was determined, but for me the choice was easy. 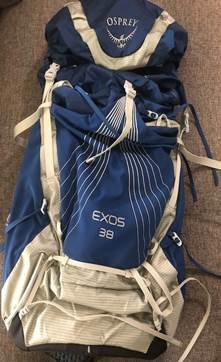 After looking at all the backpacks we already had, ordering, trying and returning mulptiple backpacks I decided the Osprey Exos 38 was right for me. At 38 liters many consider this pack to be a “Day Pack”, for me (after looking at all my gear laying out on the dining room table) it seems like just the right pack for a 10 pound total and, at 2.19 pounds it met my desired weight while including the bells and whistles of many much heavier packs. This backpack comes with large main compartment that includes a hydration pocket and a drawstring, moisture resistant seal and a flap jacket to protect the contents from rain and the elements. In addition there is a zippered compartment in the flap jacket and a large exterior pocket both of which allow access to items you might need at a moments notice. Stow and go Trekking Pole carriers and lots of clips give you everything you need on the back side for the kind of hiking we intend. 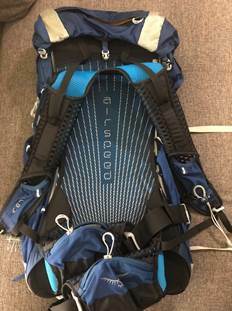 One of the most attractive features of this backpack is the “AirSpeed” Suspension system that keeps the back of the pack off your back (a lot of “ack” sounds in that sentence) and includes a mesh so the backpack breathes and is still properly supported so the weight of the contents won’t pull you backwards, I have honestly never had a pack that could accomplish this; it’s awesome. Of course all chest and should straps are adjustable and the shoulder straps include one small pocket each for your protein bar or cell phone or min-lite! I actually ordered one of last years models because it includes additional pockets on the waist band that are amazing large considering their location. Overall a great backpack and it weighs in at on 2.19 pounds. Although I am still deciding which trekking poles I am carrying what jacket and shower shoes I intend to pack, this pack with all the other items I know I will carry comes in at a total of LESS THAN 8 POUNDS! Keep following the blog and as we hike the El Camino and I will update on all the reasons my decision turn out to be WRONG J!